Have you seen the new Packaging of Beauché products in our shelves recently? Are you wondering why its packaging looks different from the one described on our previous blog entitled “AuthenticBeauché Set ”? As surprising as it may be, we assure our customers that our dealers won’t be selling fake products. Let’s take a closer look at what has been changed and why our new packaging is better. 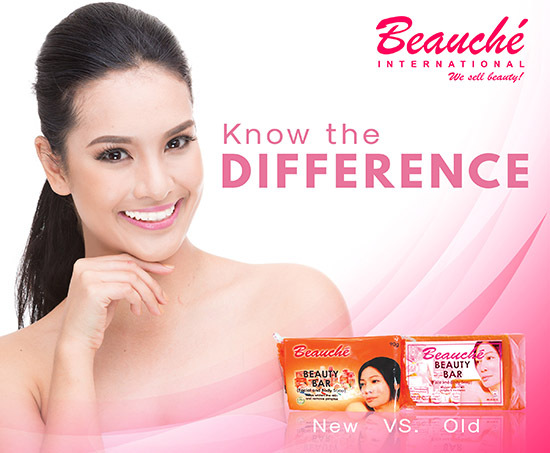 The new Beauché beauty bar and glutathione soaps are now vacuum sealed. Which means, more air is circulating inside the packaging to keep the soap free from moisture. Moreover, the durable plastic packaging contains the Beauché label with product’s manufacturing date, ingredients, and batch number. Other products such as: skin toner, clarifying solution, Age Eraser Cream, rejuvenating cream, and exfoliating cream are now marked with a plastic seal but still retain its old packaging. However, the color of the containers has been slightly changed. Rejuvenating cream is now in darker shade of green, exfoliating cream in a cobalt blue container, while the age eraser cream has a richer tone of pink. The whole packaging is also marked with Beauché’s logo including its “Halal seal”. To ensure authenticity, you may also check our distributor or reseller’s ID, and business permit to make sure you are buying the right product. Or best, buy from our outlets in selected SM branches nationwide.